Maybe it’s the time difference, I woke up fairly early, the world outside had only just begun to lighten with a shallow blue. 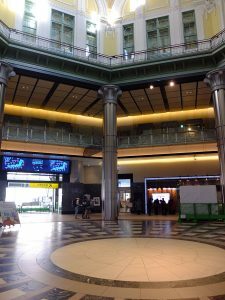 The original plan for breakfast was to check out then go to Sushisei in Tokyo station’s Gransta. That opens at 7 which was still over an hour away. I decided to grab an onigiri and enjoy it with some coffee in the lobby. After an enjoyable light breakfast I headed upstairs to pack up my things, reorganize items such as moving the inflight reading book into the suitcase. My jacket was nowhere to be found. 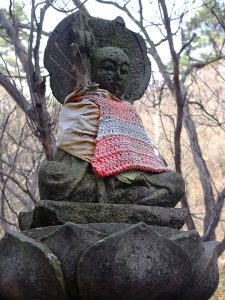 As Tokyo was not warmer than expected, I had not worn my jacket yet and it was still bundled in its special bag, almost like a rolled up mini-sleeping bag. I searched the cabin, then the floor, then the lobby. The jacket was nowhere to be found. Panic set in. Kusatsu Onsen was high up in the mountains, the temperatures was in the single digits and might even be below zero at night. I had better find that jacket or I would have to buy a replacement. At least Uniqlo was everywhere, it was a problem that could be solved with money, albeit an expensive one. I asked the front desk if anyone had found a jacket. No one had. Someone might have taken it but it seemed like it would be a silly thing to steal. 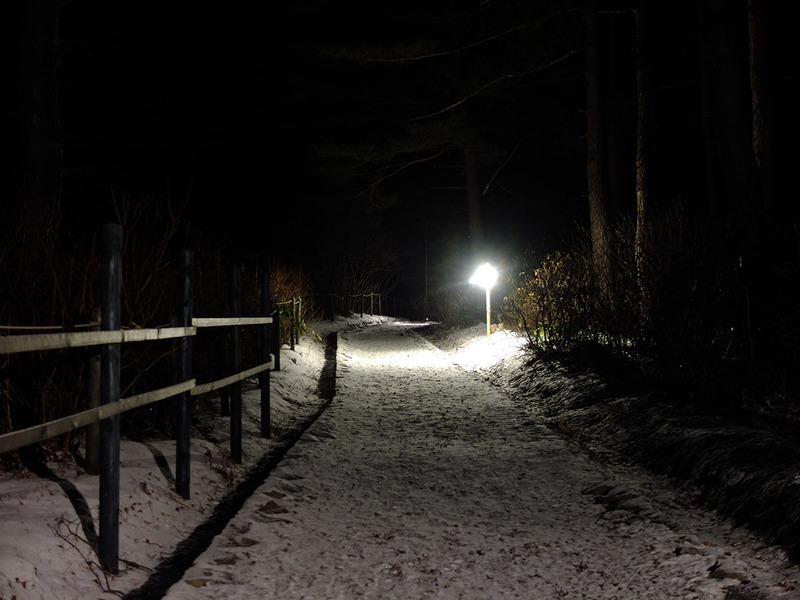 I checked out all the same and decided to check outside, backtracking my path from the station last night. The streets looked very different in the day, hard to tell if I was looking at the same streets so I sweeped an extra one or two to be sure. Nothing was found. At this point I was sure I had lost it between the station and Global Cabin, since I had a vague memory of adjusting the straps tying it to the backpack before getting on the train at Shinagawa and if I had lost it on the train other passengers were sure to call out. 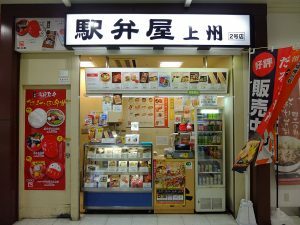 I ran back to the Cabin front desk and asked them if it’s better if I ask nearby convenience stores or check with the police. The police, was the reply, and they pointed me to a police post by the station. 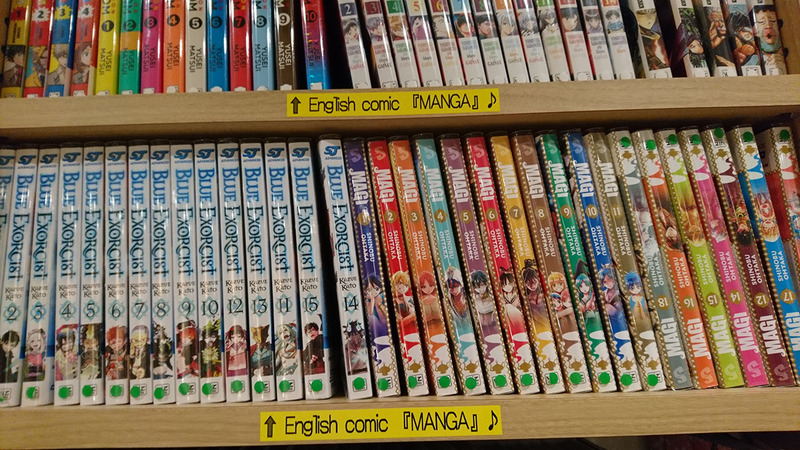 In retrospect, my Japanese had really improved enough that I could explain the situation without looking up words and speak pre-translating from English in the head. They asked me about the jacket’s appearance, when I lost it. They nodded when I mentioned the jacket’s brand. A good sign. Someone did bring in something similar to what I was describing, they said, but it was not there. Wait, they found it but it was not there? I was thoroughly confused and my heart dropped. One of the policeman gestured for me to follow him out. He pointed to a map on the giant board nearby. 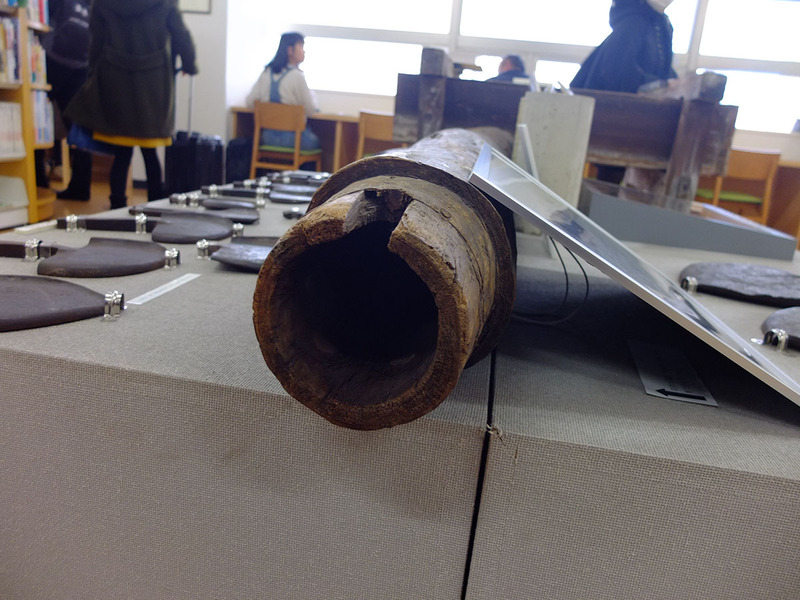 Someone did bring it in, and they had sent it on to the main Osaki police station, I would have to go there to pick it up. I was relieved. The trip was going to be delayed but it looked like I was going to get my jacket back. I thanked the policemen and they fared me well, wishing me to take care. 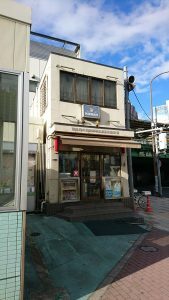 Osaki police station was about 10 minutes walk from Gotanda station. There was a policeman standing on duty outside and after explaining, he pointed me to the second floor. Inside, I was asked to fill in some forms and waited for them to bring out the jacket. There were some confusion because apparently my jacket had been brought in with another bag full of things which they assumed belonged to the same person. They had to call the police post to double check whether the person who brought them in said the jacket was found with the bag or near the bag. I was asked to check the jacket to confirm it was mine. The strap of the jacket’s bag had snapped which must be why it fell off the backpack. After about 30 minutes, I finally left happy with my jacket in hand. I returned to Gotanda and thanked the policemen at the patrol post, then resumed my planned day. It wasn’t such a bad experience. 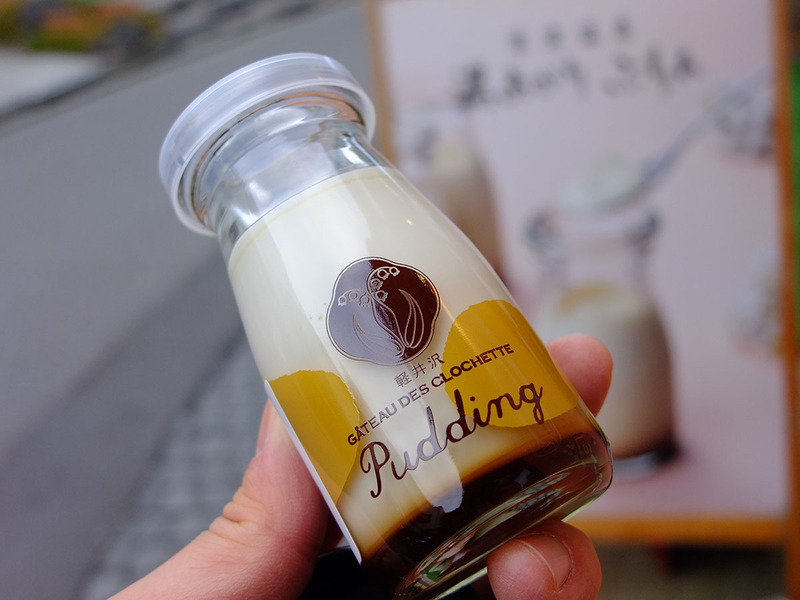 The lost and found in Japan was as legendary as people said. Still, best take extra care going forward. It was by now after 8:30 and way behind schedule. 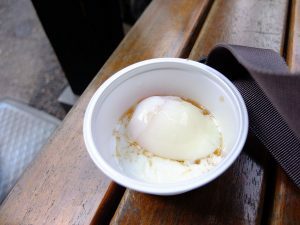 I had not had breakfast yet and I had not bought my rail pass either. I was definitely going to miss the direct express from Ueno to Naganohara-Kusatsuguchi. 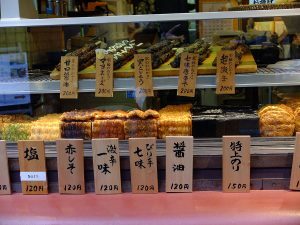 The best hope was skipping breakfast and see how much time I could make up by taking the shinkansen to Takasaki. I got my pass at Tokyo station at the JR East tour office at the Marunouchi north exit. Unfortunately looked like I was going to miss the shinkansen train by a few minutes that would have allowed me to catch up to the Kusatsu express at Takasaki. I checked the connections timetable. 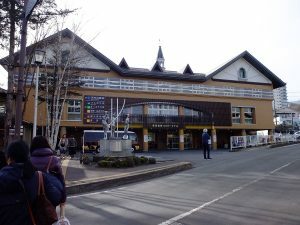 Was not too bad, I would have to take the local train from Takasaki to Naganohara-Kusatsuguchi and arrive about 30 minutes later than I would have with the express. The shinkansen train was a soon to be phased out E4 series, the only double decker shinkansen train type. 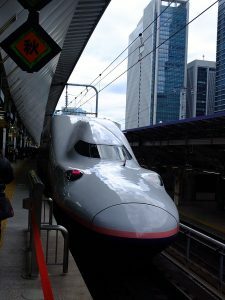 The E4 train was being phased out because it was old and too slow compared to the E7 on the Hokuriku line which shared some of the tracks. An accidental luck that I managed to ride the double decker before it was gone. The train definitely had an aged feel to it. The lighting was not as bright and the seat cushions a little faded. 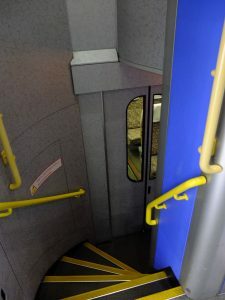 Because of the double decking the vestibule area felt crowded, cramming in an elevator for the onboard service trolleys and stairs heading up and down. Originally I headed downstairs as there were less people, then I thought it there were still seats, why not go upstairs to enjoy the better view. That was one advantage with the double deck, the upper deck offered a high vantage point often over the sound barriers by the tracks. After Omiya when the buildings begins to thin out, I noticed a small white peak in the distance. 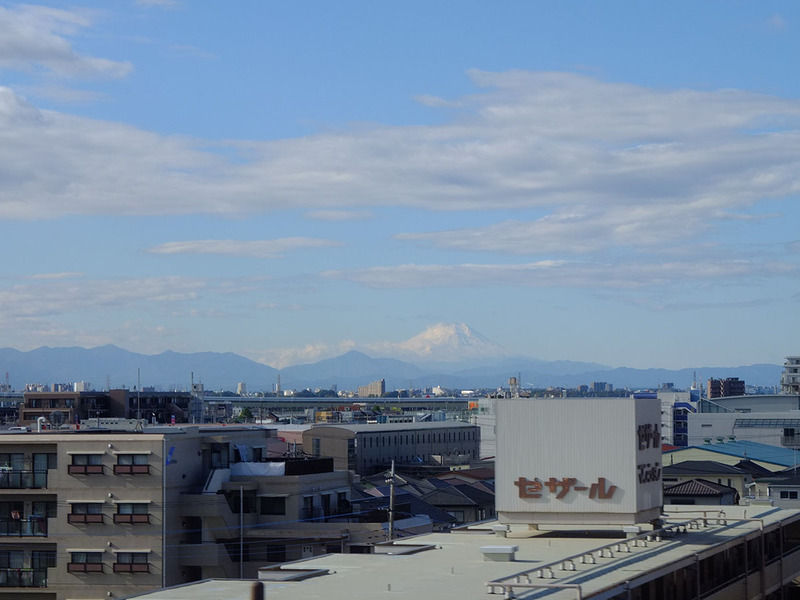 It was Mount Fuji. 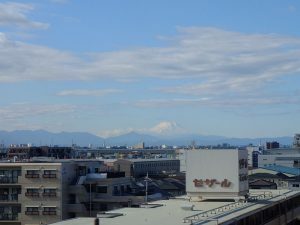 Even if Hakone failed to give a clear view of the mountain, I can say I have once seen the great Mount Fuji. It would be past 12 by the time the local train gets to Kusatsu and I only had a single onigiri for breakfast. I grabbed a drink and an eki-ben to eat on the way. 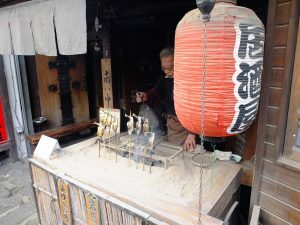 The stationed sold daruma shaped eki-bens. 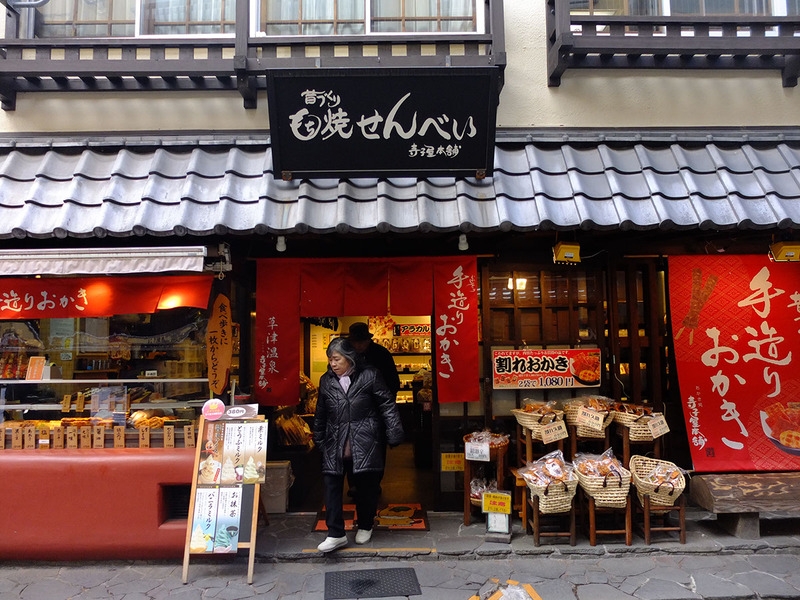 Takasaki was home to the famous Daruma temple which I planned on visiting on the way back. A surprising number of people boarded the train. Even well past the small township dotted rural areas there were still a quarter of the people left on board. 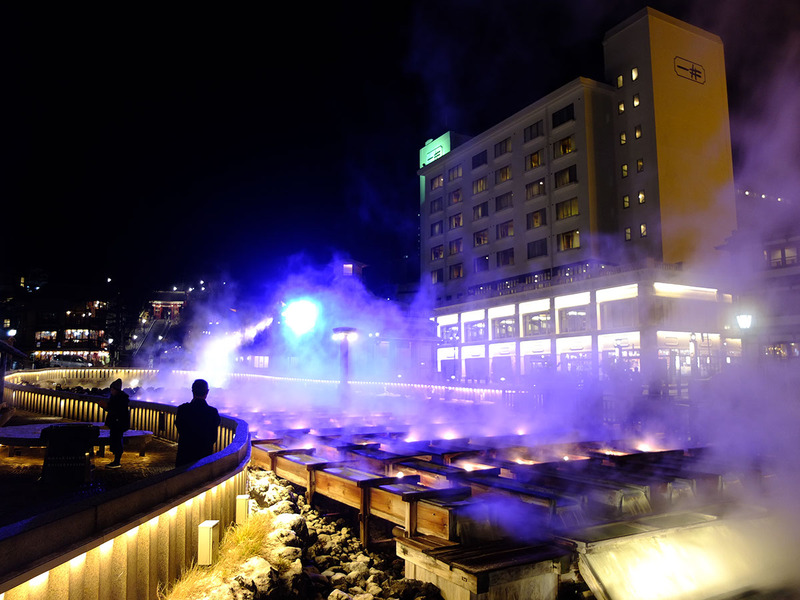 Guess there were just that many people headed for Kusatsu. The view outside reminded of when I went to Yamadera. Steep mountain valleys of red and orange basked in a golden light. Occasionally a few homesteads popped into view across the river before the train disappeared into narrow tunnels. 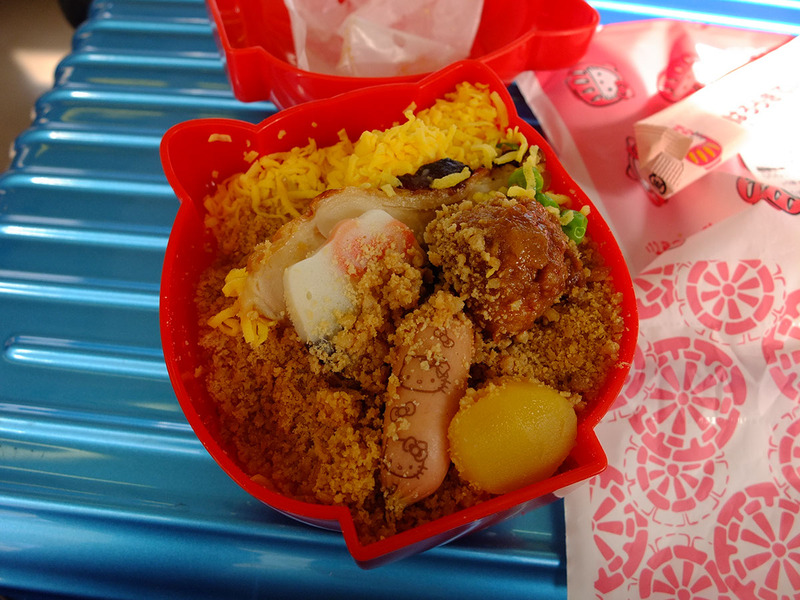 Bento. Taste is okay, may have needed some pickles to refresh the taste. 90 minutes later the train finally arrived at Naganohara-Kusatsuguchi. Almost 3 hours since departing from Tokyo and there was still some way to go. There was still another 25 minutes bus ride from here to Kusatsu Onsen. Scores of passengers streamed through the station and onto the connecting bus. The bus accepted suica which I used. One could also take a boarding token and pay on disembarking. 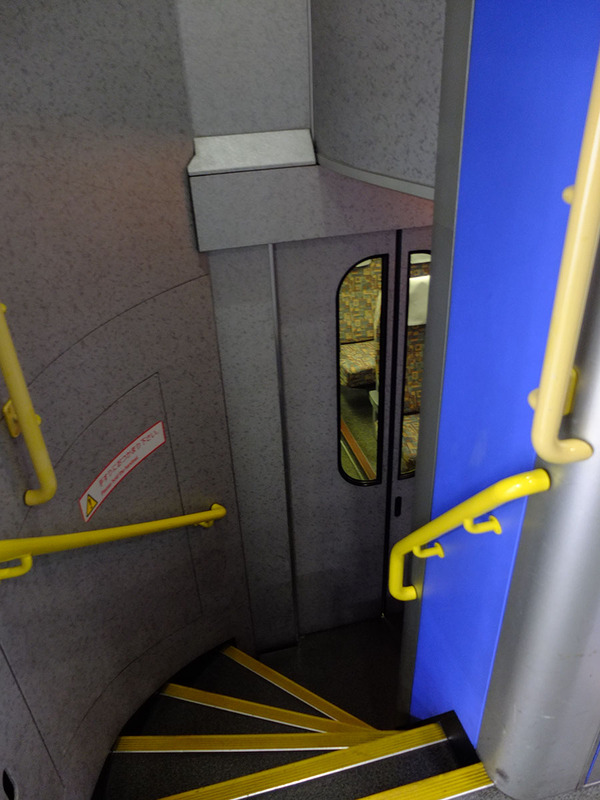 The bus had undercar storage so luggages are no problem. 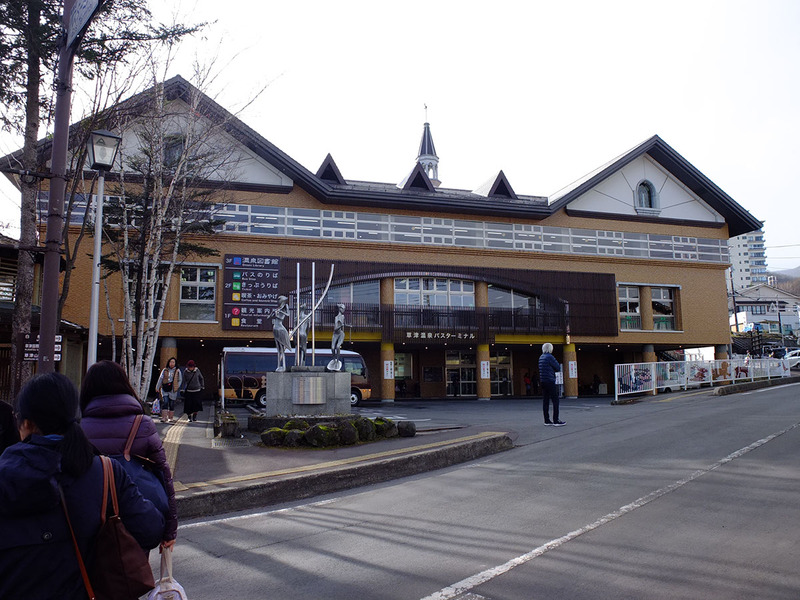 After winding through the mountains, the bus finally pulls into Kusatsu bus terminal. 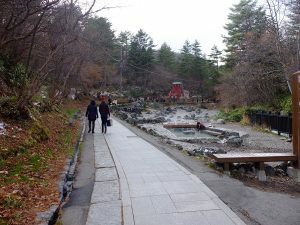 On automatic mode, I followed the others to the Yubatake, the famous onsen field that flowed through the middle of town. I had walked the length of it before realizing I had been looking at the map the wrong way. 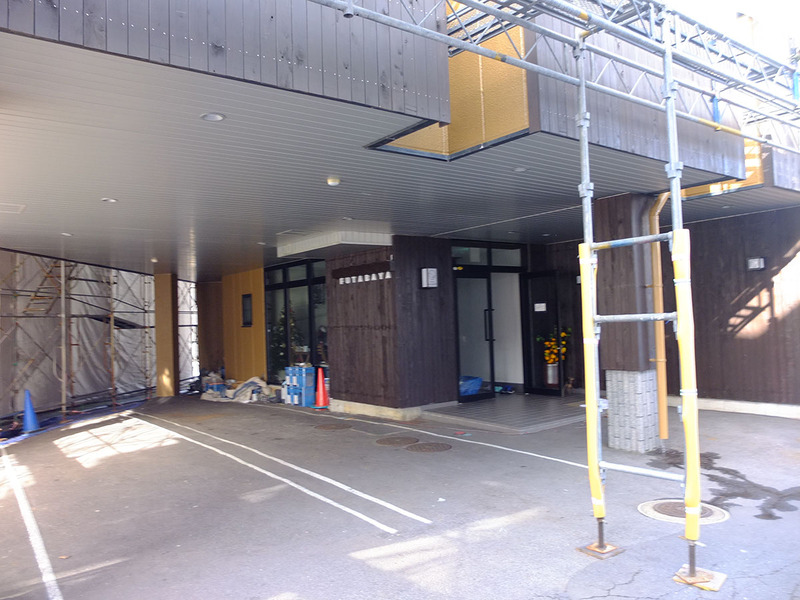 The bus terminal was on the same side of the Yubatake as my hotel which meant I had walked way past it already. Grumpily I dragged my luggage back up the road. 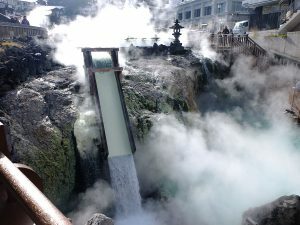 My stay in Kusatsu was Futabaya. A small hotel with a special focus on catering to foreigners (I chose it only because it’s close to the yubatake). It was early however and only the owner was there, a slightly grumpy old man who had thought I had showed up expecting to check-in. His tone improved when I told him in Japanese I just wanted to leave my luggage there. 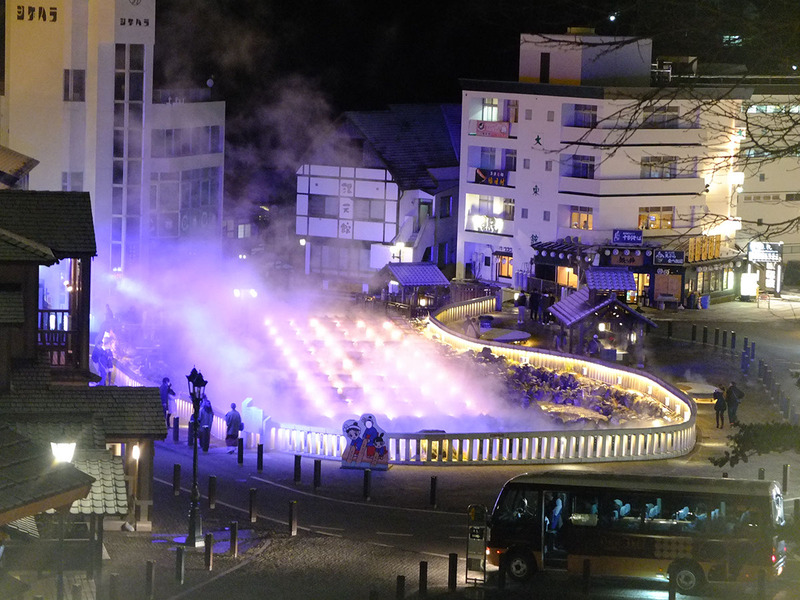 Time to hit the onsen town streets. 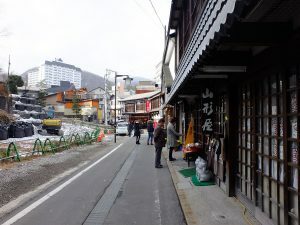 Since I did not intend to visit the onsens till after check-in (obviously), I took the opportunity to check out the Yubatake and many shops lining the nearby streets. 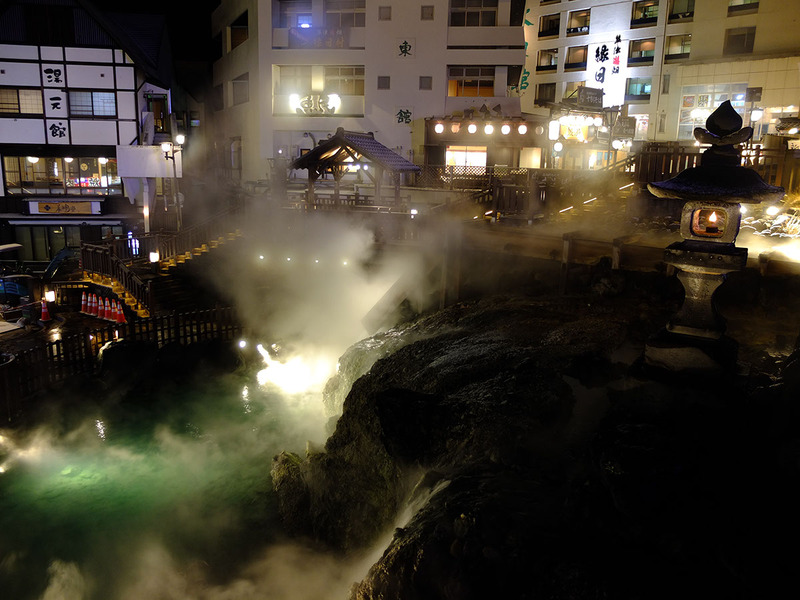 Kusatsu could be described as the postcard onsen town. Even its layout was perfect, I could not tell whether this was by design or very good fortune of geography. The town was of course centred by the Yubatake which was a long oval dividing the town into roughly 4 directions. Top (where the source of the onsen pours forth), down (where the onsen pours in a magnificent waterfall into the pool below) and left side, right side. 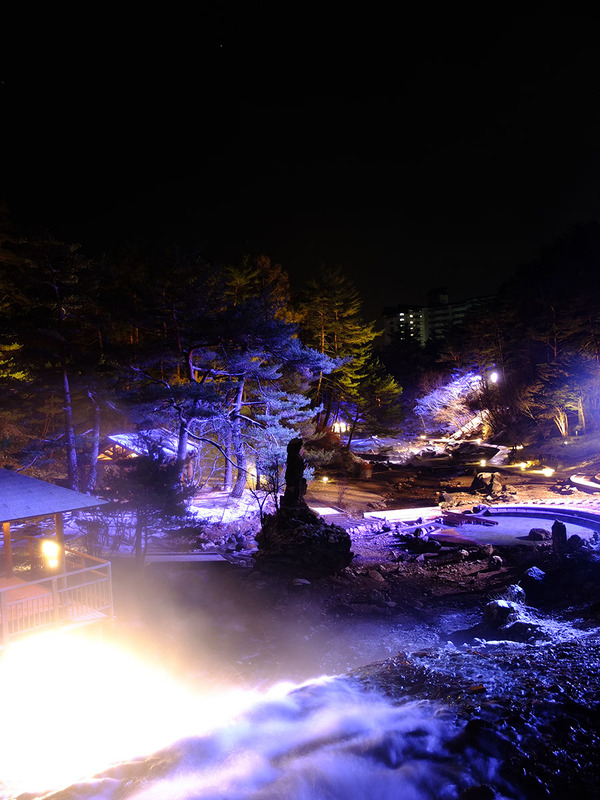 At the top was a large open courtyard sits the community onsen Sirohatanoyu, the imposing public onsen Gozanoyu. 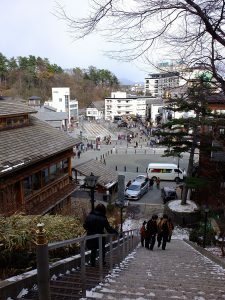 At one end of the courtyard a flight of steep steps lead to a shrine on top of a hill which provided excellent view of the town. 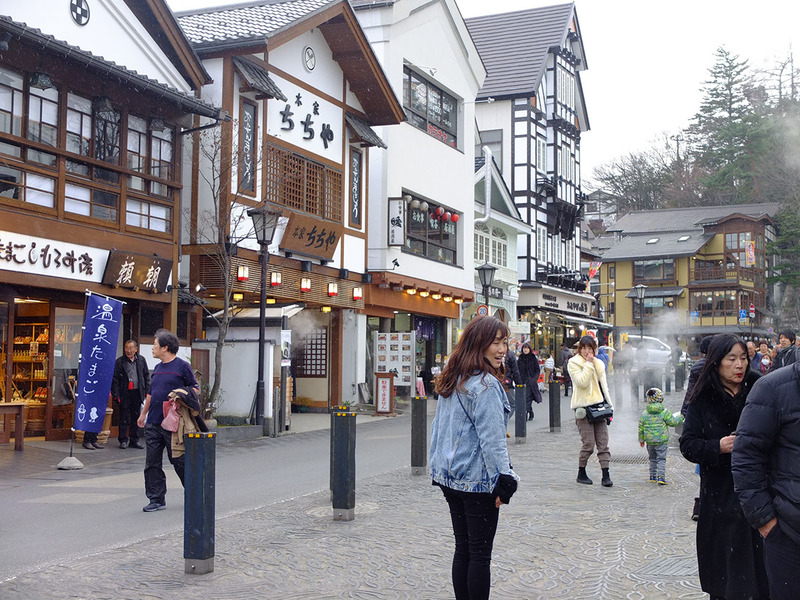 On the left side was a footbath and rows of shops in traditional looking housing. 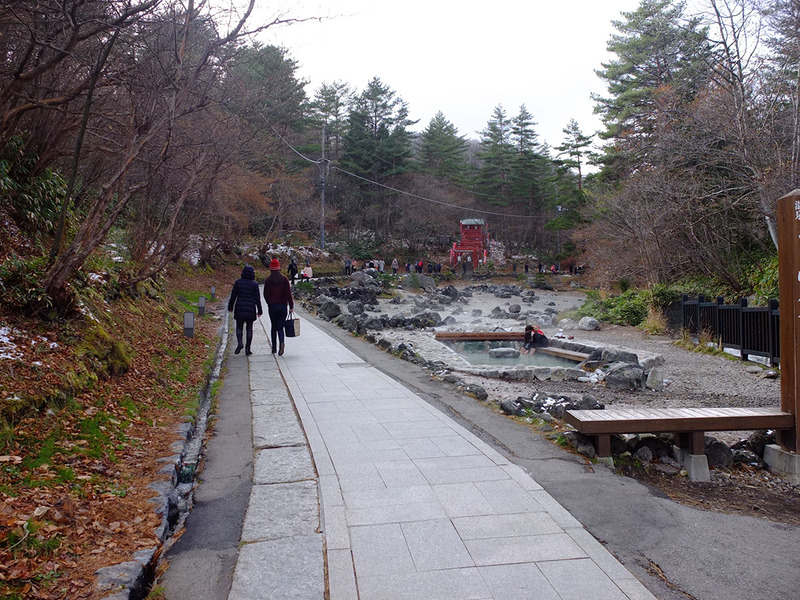 From the bottom the main road leads out to the other many community onsens dotted throughout Kusatsu. 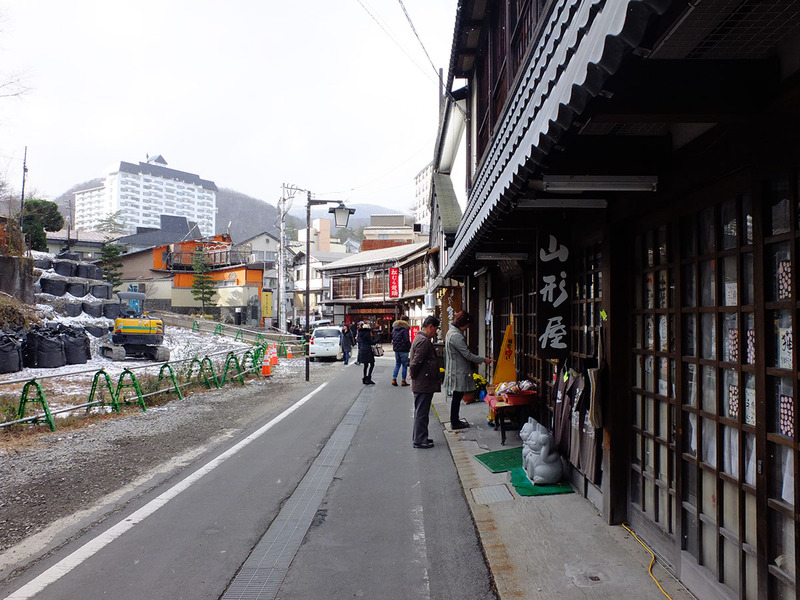 To the right was the Netsunoyu where the traditional Yumomi performances was performed (more on that later), and a very well situated 7-11. 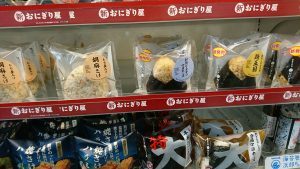 There were other convenience stores in Kusatsu (there’s a Lawson opposite the bus centre), though in more out the way locations. 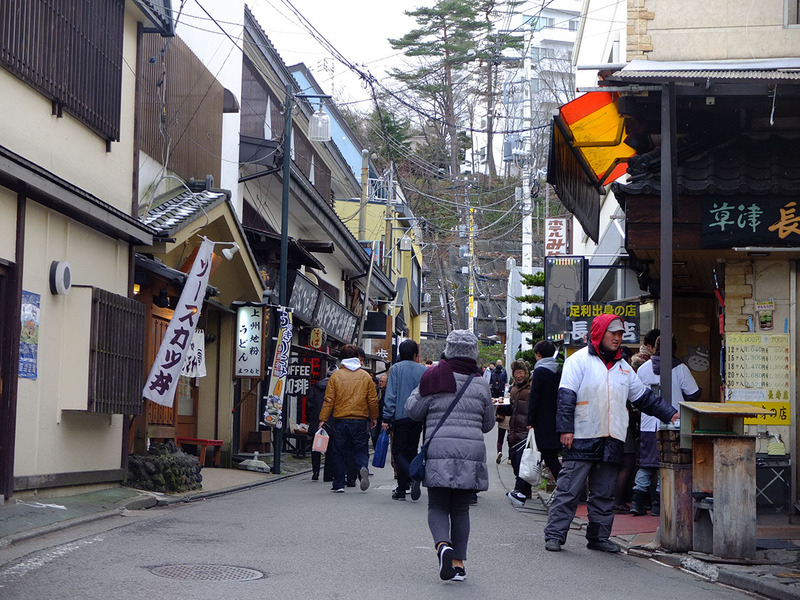 Between the Netsunoyu and 7-11 leads the main onsen street to Sai no Kawara park and open air onsen. 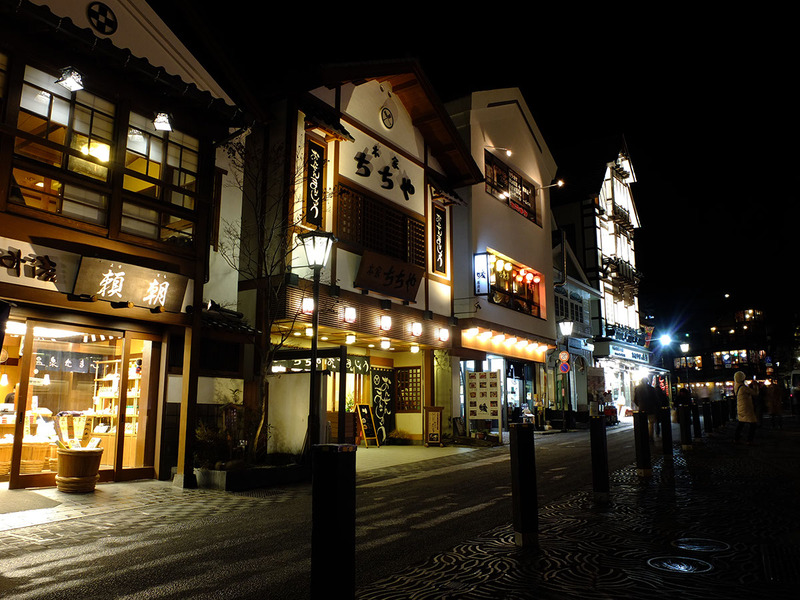 It was very well laid out, the streets were compact giving a cozy feeling. 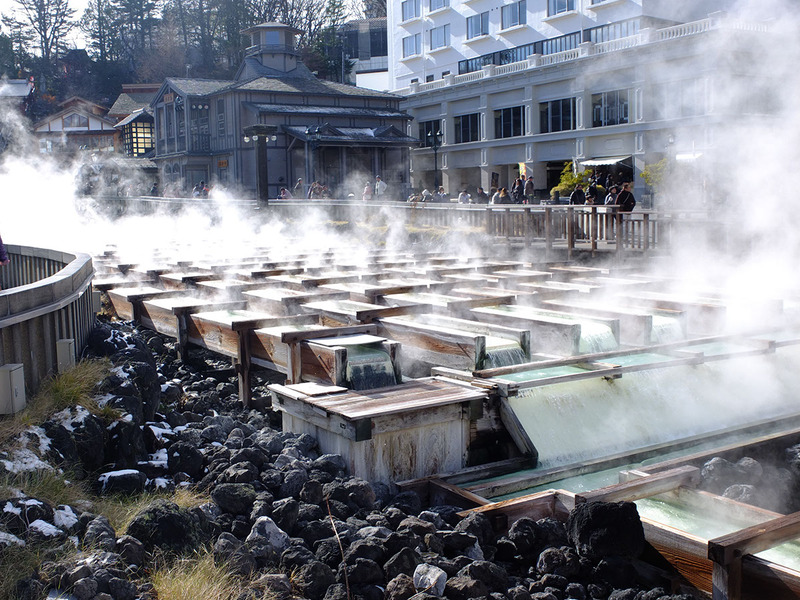 The constant steam from the onsens whirled and danced in the cold air, ever changing. 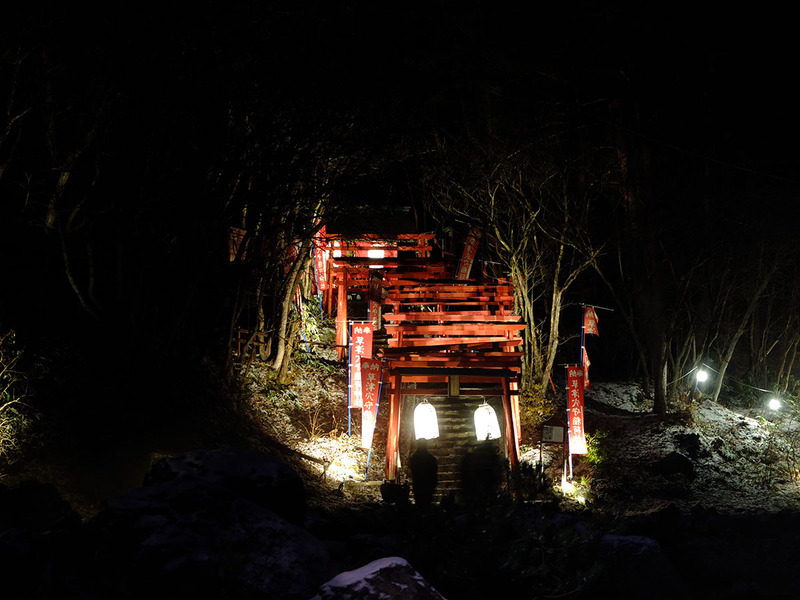 The Yubatake was a sight to behold and could be viewed from many angles. The onsen street to Sai no Kawara was not long but packed with all kind of interesting shops, sweets, grills, manju (steamed bun), souvenirs, traditional crafts. In comparison Yufuin had way more shops and variety, however because they tended to be more modern and fashionable they lacked a sort of cohesive charm. Yufuin’s onsens were also all hidden away in the hotels and ryokans, there were barely any public baths, felt more like a resort than a traditional onsen. 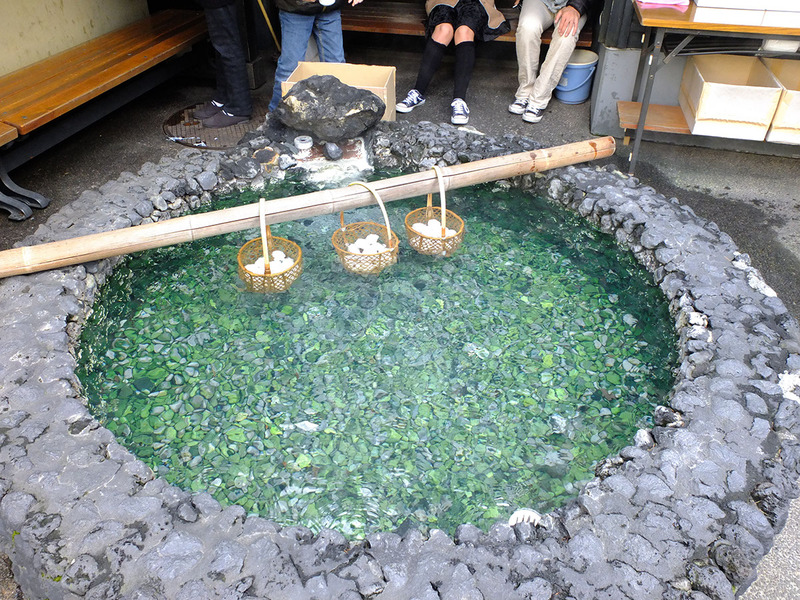 In Kusatsu the presence of onsen permeates its every stone and wood. It was snowing lightly. The woods and roofs were covered in a thin layer of frost, the weather did nothing to dampen the spirits. 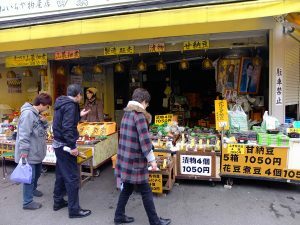 The streets were busy, filled with tourists and air of excitement. 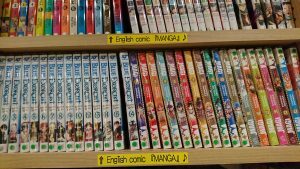 I went back and up to the bus terminal where the community library was also located. 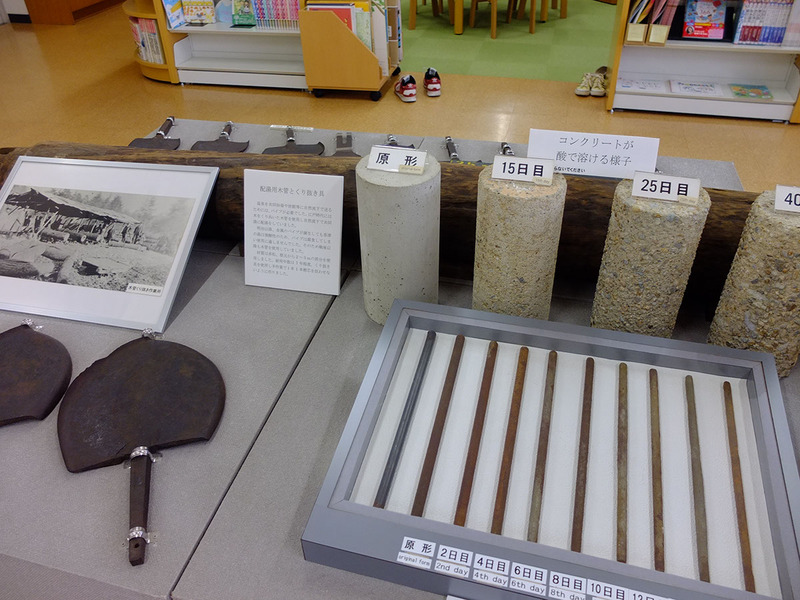 In the library was a section detailing the history of Kusatsu and how onsen is tied to the town’s development. 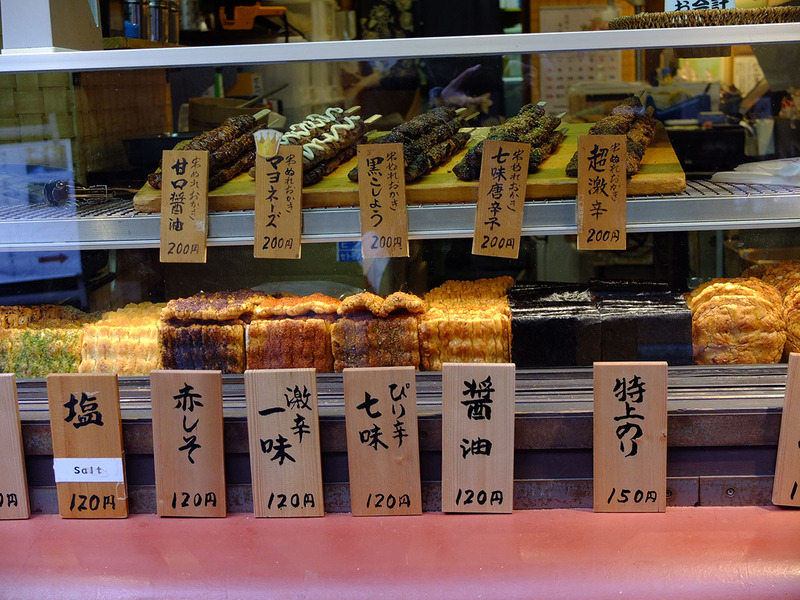 Then proceeded to walk the length of the onsen street to Sai no Kawara Park, then went fooding on the way back. There was plenty of food to try if I wanted, but I settled on the onsen egg and pudding. 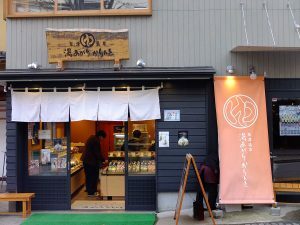 One of the manju shop was generous enough to offer every passerby a freshly steamed manju, a cup of green tea, and a welcomed seat inside the shop. That earned them a lot of customers. It’s soon time to check in. 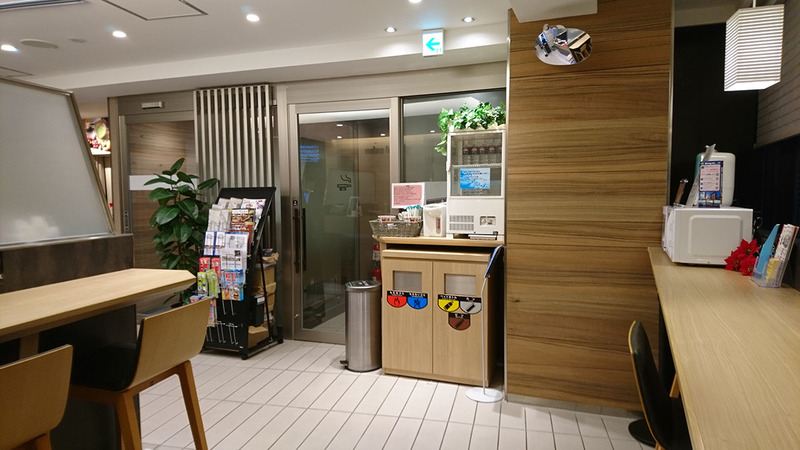 The front desk was attended by what looked to be a young man from the middle east or southeast asia, who spoke decent enough english, one of the foreign workers that Japan is feverishly recruiting to make tourism more welcoming to foreigners. 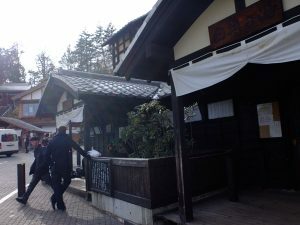 He handed me a discount voucher to various baths and shops (every accomodation in Kusatsu give out these to guests) a map of the town and recommended some of the onsen baths to me. 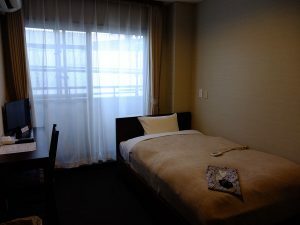 He also gave me a bag containing a bottle of juice, a yoghurt and two pieces of bread, what was described as a “light breakfast” so they could qualify as providing breakfast on the booking websites. Would have rather they lopped 500Y off the price and I’d buy what I wanted from the 7-11. 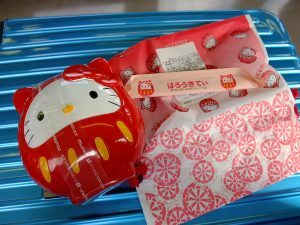 They did provide two sets of towels, a set of yukata and a handbag for easy carrying. A much appreciated offering. 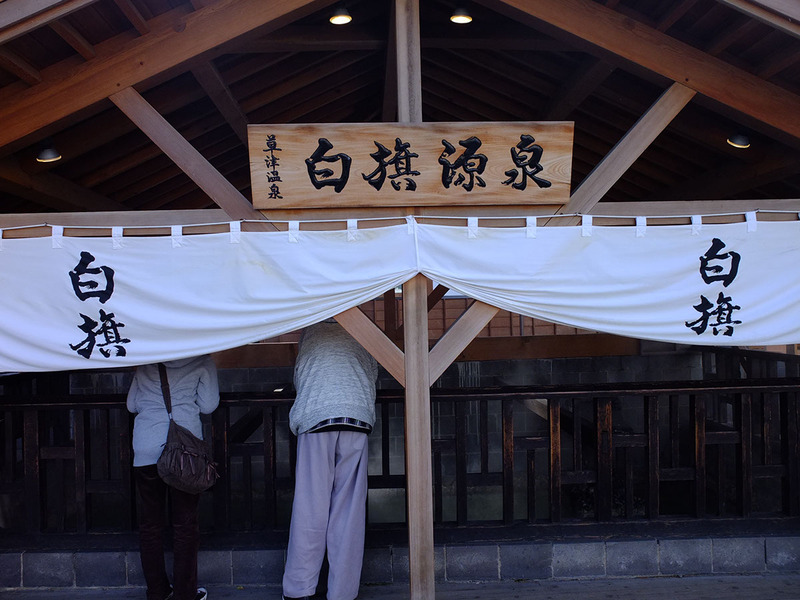 I changed into the yukata and headed out to the onsen. In the lobby there was another group of foreigners checking in. 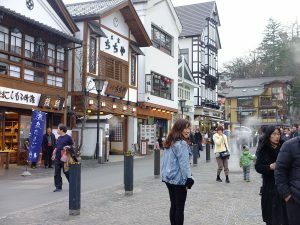 They were thoroughly confused when they saw me in the yukata. Did they have to wear them to go to then onsen? they asked. Only if they wanted to, the young man attending the front desk told them. But it’s much more convenient if you wear them, I added. My first stop was the Shirohata no Yu, the one in the main square and also the closest one to the hotel. 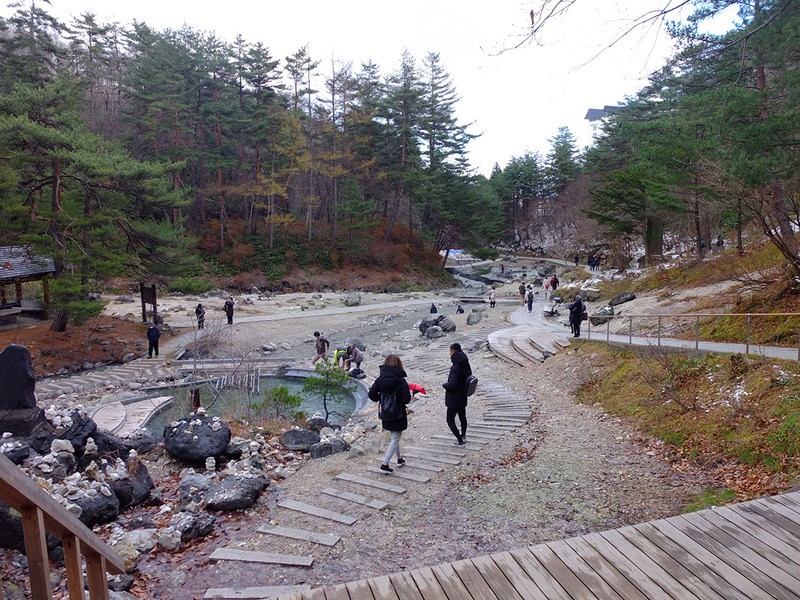 Entry is free, the bath is maintained by the Kusatsu town community. The place was tiny, in the peak season this place had to be packed. 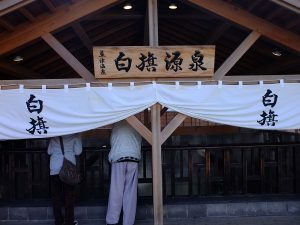 In the small rustic wooden building there were barely any divisions between the entrance, the changing area and the bathing area. 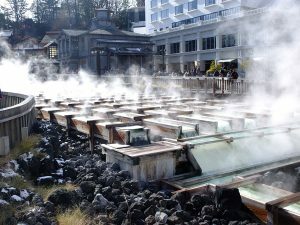 There was no need for any heaters in the changing space because of the constant steam pouring over from the baths. 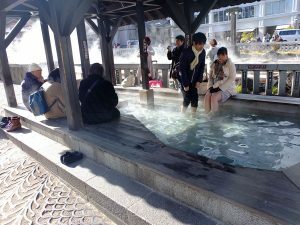 There were 3 baths, each large enough to maybe sit 5-6 people. There were no showering area, before entering the bath one was expected to fetch water from the baths into a bucket then wipe down the body with a towel (which you must bring yourself). No soaps. 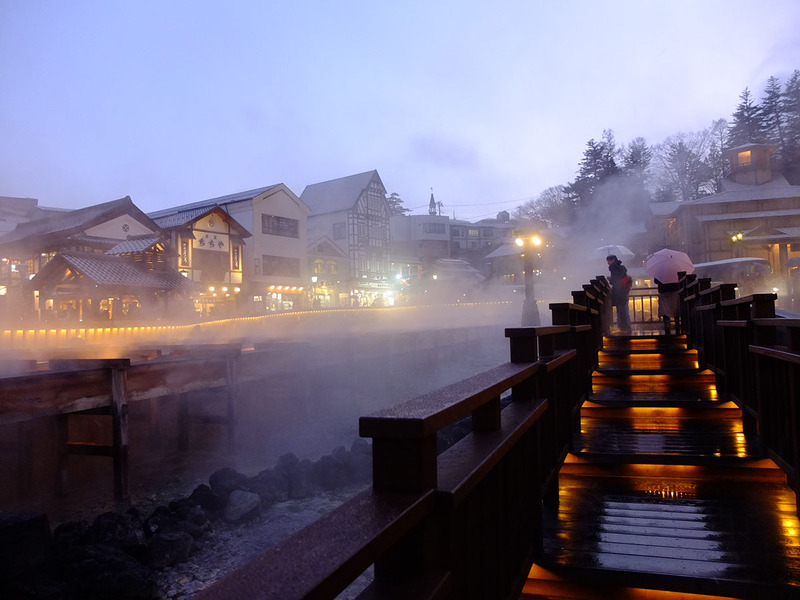 The onsen water was hot. The hottest I had ever experienced. 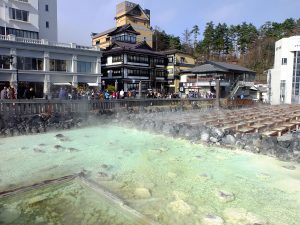 According to the descriptions, because the source water in Kusatsu are so hot, some as high as over 90 degrees, most of the baths also tend to be quite hot. A few minutes was all I could stand at a time before getting out of the water. When I got back to the hotel the staff told me that Shirohata was actually one of the hottest bath around, the map he gave me actually had a hotness rating next to each bath. 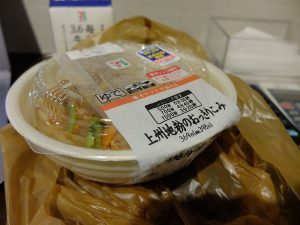 It was nearing nighttime and I head out to get something to eat from the 7-11. 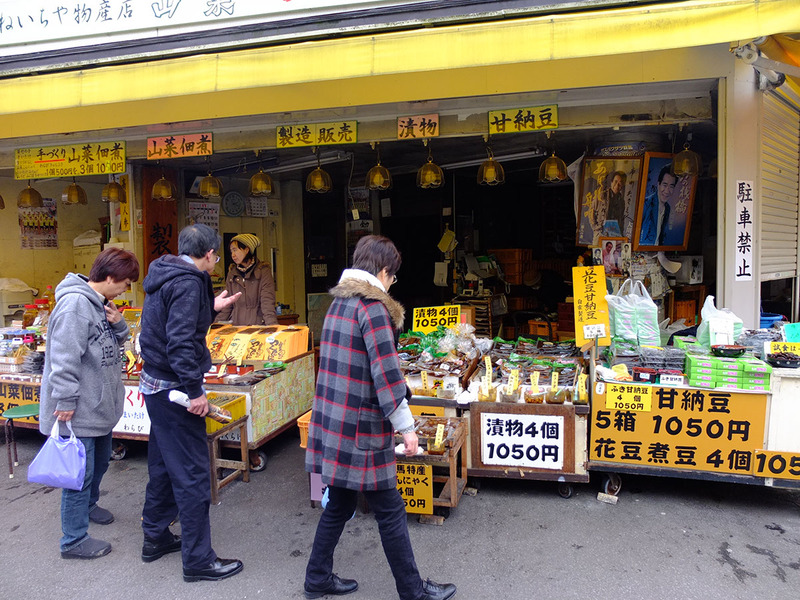 There were some food places around, I just got lazy again. 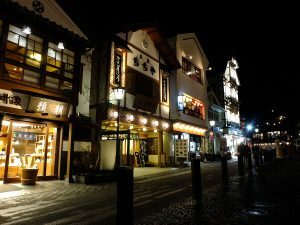 After dinner I got out of the yukata. It was getting cold and snowing and there was no hanten provided for warmth. One thing that was very different about Kusatsu was how late the shops open. 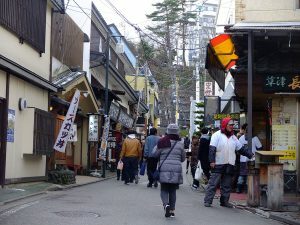 The main onsen street still had saw activity up till about 6pm, the shops around the yubatake area opened till 9pm, there was plenty of time to wander around and visit the shops even if one arrived late in the afternoon. Bus loads of people who stayed at hotels on the outskirts were being dropped off in the square, the illuminated yubatake elicited many impressed sounds from them. 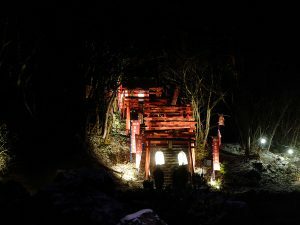 The yubatake was a marvelous sight to behold at night. The colours changed every so often, shining through and reflecting off the dancing steam. The whole square was awash in contrasting lights and shadows, almost magical. 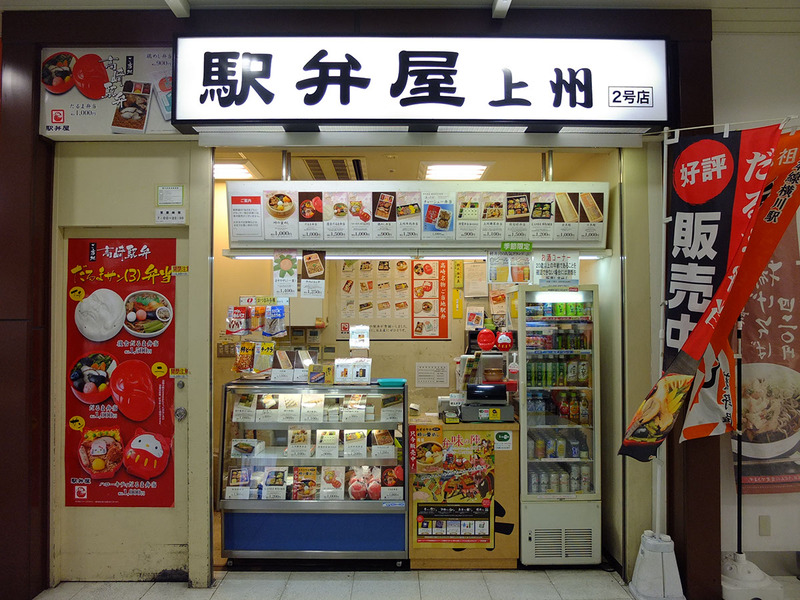 I grabbed a hot coffee from the 7-11 and sat down outside a souvenir shop, beneath its eaves. 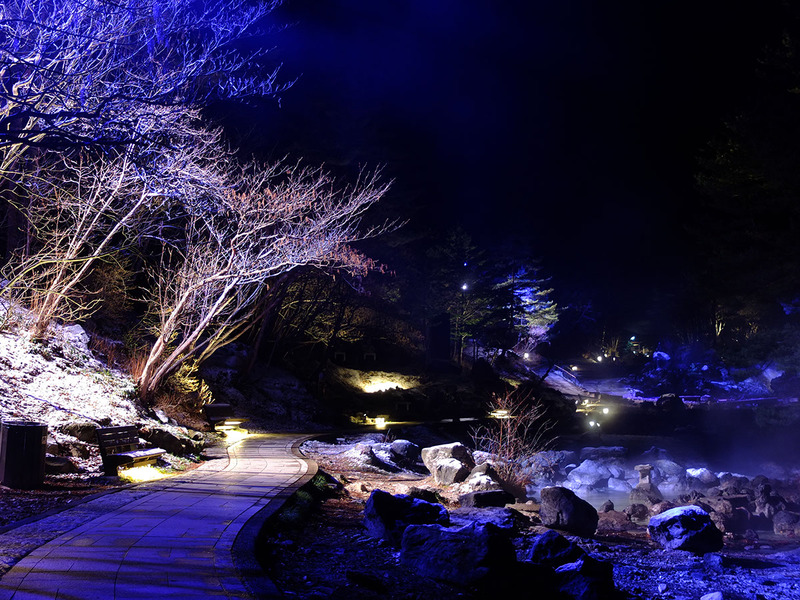 Watching the light snow flicker in the spotlight against the dark skies, observing the crowd passing by. feeling the cold breeze and the warmth of the coffee. It was a shame it took me this long to come here. And I wished I did not come alone. The Sai no Kawara park was similarly lit up. 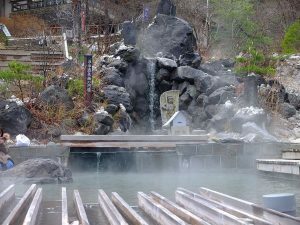 Here it had an almost ethereal feel, almost would be a little creep if there weren’t the sparse bath goers heading to and from the Sai no Kawara onsen bath. They might have chose this presentation because of the legends of the onis (demons). 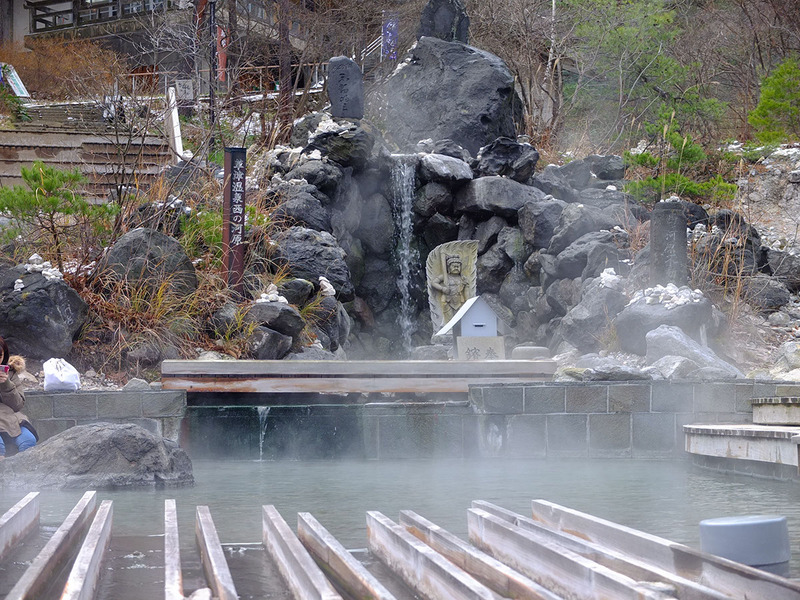 It was said that the sounds of the bubbling hot springs were mistaken to be the sound of oni playing sumo wrestling. There was a small flight of steps that led to a path on top of the ridge going to the other side of the park. 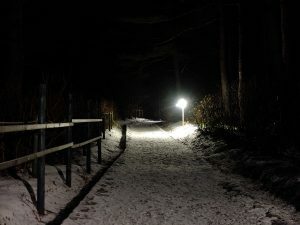 At this time of day there were no one else on the trail, it was covered in snow and I left a clear trail of foot prints. 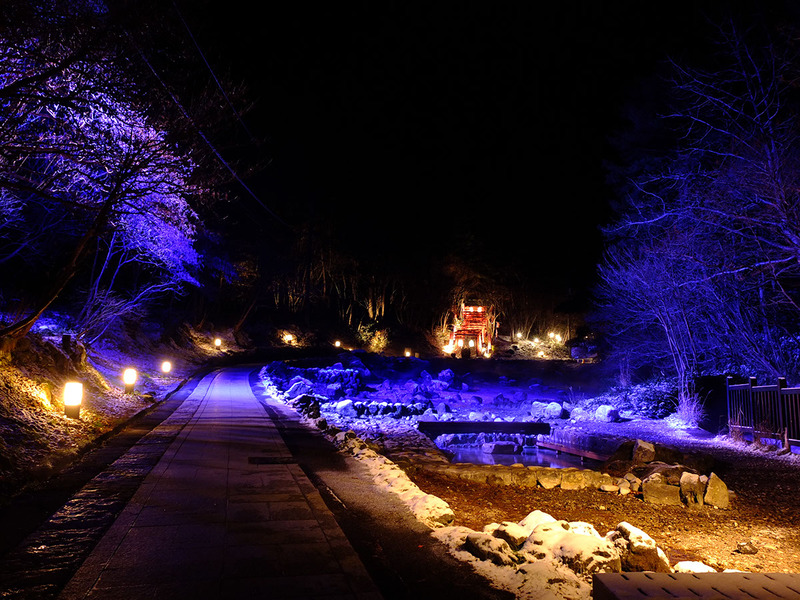 The paths was lit by a line of lights that were broken at intervals. The story of the snow witch from the Kendaichi manga for some reason flooded the mind, in which people stranded in a snow storm were brutally hacked to bits by a machete wielding snow demon. I decided to turn back. There might be bears about. Definitely not because of the possibility of snow demons. My camera’s battery was almost flat at this point, the shops in the square was also closing up. The last of the tourists were getting on the last shuttle buses to go back to their hotels. I decide to also call it a day.